Our history goes back to 1914. In 1985, we became ROFI and started the journey to who and what we are today. In the mid 1980’s, we introduced the first tents, which today form a wide product range from traditional family tents to large tents for hospitals, accommodation and many other purposes. Today we do tents based on metallic frames as well as inflating technology for rapid deployment. We have 35 years of practice in customizing our tents to fit the needs of the people living and working under difficult conditions, optimizing the work efficiency, comfort and safety. In the late 1980’s we developed the first edition of deminer vests, body armor and aprons. We have been cooperating with some of the world’s leading demining organizations, and are privileged in being a preferred supplier and partner of protection solutions to UN agencies, NGOs and defense customers. Throughout the past 35 years we have deployed our products in more than 60 countries worldwide, and are proud to give our contribution in protecting people working and living under demanding conditions. This is why we have chosen “Protecting People” as our vision. 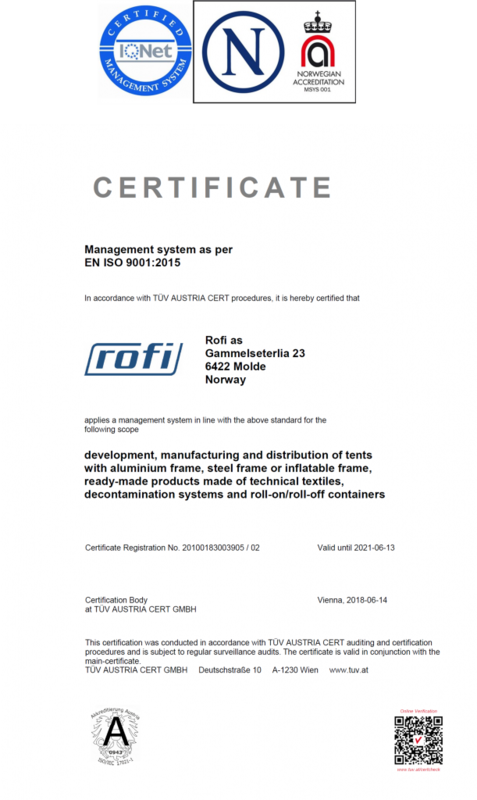 We hold an ISO 9001 certificate and we continue to improve our processes and quality to be able to deliver the best product possible.